Over the past 4 years, more than 6,000 miles were logged by 200+ individuals in over 30 different events benefiting local charities. There have been many PRs, fun times, and dollars raised! 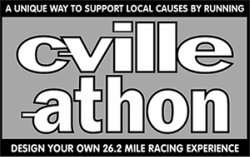 ​An amazing 84 runners completed the inaugural C-VILLE-athon in 2015, 79 runners submitted forms for 2016, and 75 runners completed the 2017 challenge! There are a record 103 finishers for 2018! Who has completed the C-VILLE-athon every year?! See the list of streakers. ﻿Sign up online (it's FREE!) and then run any combination of the races on the calendar, as long as the cumulative distance adds up to 26.2 miles or more. ﻿﻿Sponsored by Ragged Mountain Running & Walking Shop, Charlottesville Track Club, and C-VILLE Weekly.